Backyard Bee Hive Blog: Harumph! Let me preface this post by stating that I'm rather cranky right now, having just learned that not only am I very allergic to honeybee sting, the four other venoms in the category will cause anaphylaxis as well, so if I do proceed with the desensitization therapy it will cost me the maximum amount possible, none covered by insurance as a result of my $5,000 deductible. 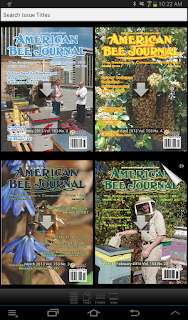 American Bee Journal, which first came into print in 1861, has been available digitally via "Online delivery" for several years, providing subscribers with an electronic duplicate of the print edition but enhanced with live links. * Now with the ABJ app, available for both AppleOS and Android devices, you can read the magazine on a tablet. A digital subscription is $16/year, or you can purchase a 3-month subscription for just $3.99 like I did. Downloading my first issue was easy, requiring a simple tap on the cover. Navigation from page to page is fairly simple and intuitive. But I am glad I only splurged for a trial, as I found the magazine very difficult to actually read. Zooming on my tablet was neither smooth nor quick, and after rendering the enlarged image, moving the page was herky jerky. The cognitive impairment I have from MdDS causes me to lose the meaning of a sentence before I've gotten to the period, so physically losing the beginning of a sentence when the end would finally come into focus made the issue impossible to read, really. Online delivery. What exactly does that mean? One might think as I did, that the next issues would be, oh I don't know, delivered. Nope. Dadant is supposed to alert you when a new issue is available for download. Fail. Every once in awhile I would just launch the app and browse the new covers, hoping for a really worthwhile issue to become available. I never could quite read the covers, though, so I just had the one issue I had picked at random. Or so I thought. You can tell which issue you've already "downloaded" by the turned down corner. The issues you haven't downloaded invite you to do so with a big arrow. That's about the only thing that's big, unfortunately. I found the teaser copy on the covers frustratingly small and illegible, and you can't zoom so you just have to guess what the issue topics are. Download. What exactly does that mean? It turns out, the issue is not truly downloaded to your device. One day I launched the app to see if any new issues might be worth the eye strain. The app asked me to log in! Apparently my subscription had ended (again no notice received), and I didn't even have access to the one issue with the turned down corner. In the current version (2.3.11), issues can only be read in-app if you are an active subscriber. When your subscription expires the only way to read the issues you've purchased is if you've downloaded them as PDFs. ** Dadant customer service granted me an extension, just long enough to grab a couple issues via my PC where a nice big monitor enabled me to read the covers. I now have 3 issues on my PC, which I suppose I could house in Google Drive for access on my tablet, but that's a lot of work considering the issues exist within the app which resides on my tablet already. I have to give Dadant props. 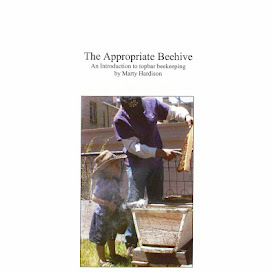 They are a beekeeping supply company run by beekeepers for beekeepers. But if you're going to do something, do it right. You can't just put out an app because everyone and their uncle has one. Although Windows8 is blurring the lines between mobile and desktop experiences, user expectations are completely different. An app is for mobile devices. We want everything now, where ever we are, we want it fast, pinch and zoomable, and we want it all in-app. If your app doesn't deliver seamlessly on-the-go it's a dud. So there you have it. ABJ is a dud. * as long as you are using their BlueToad reader.